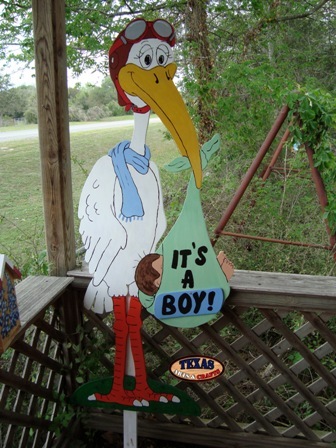 We build the It's a Boy Stork in our workshop. The stork is painted white, orange, and yellow. The baby package is painted green. The sign reads It's a Boy. The dimensions are approximately 45.50 inches tall by 22.50 inches wide by 1.50 inches deep. The sign is a local item only, and should be picked up from our shop or from a craft show.